..but keeping the road ahead in sight. A creative detour may not be the path I have started on in the last few months. The thought occurred to me that the creative detour may have been the road I chose three years ago. Perhaps I have been on one long extended detour and now, and only now, am I on the road that I should have been on long ago. Does that make sense? If it sounds like I am soul searching, yes, definitely, I am! I wonder if this is a common occurrence amongst artists and other creatives? I am really not sure if I am avoiding a roadblock, as detours are often meant to do, or whether I am simply taking a fork in the road to visit new scenery. In the past months, I have been transitioning to painting landscapes and flowers. Contrary to my portraits, this was a bit of a forced decision: I needed to challenge myself and taking my art in a new direction was the way I chose to do this. Like most artists, I am always questioning the work I am doing. Am I happy with it? Am I learning something new? Where is it bringing me? For some time, I felt like I was travelling down the same road always looking at a flat horizon. I wasn’t exactly happy or satisfied with my work. If you have visited the Canadian Prairies, you know what I mean. The land, although beautiful at first, becomes a monotonous landscape to drive through for days on end. Most Canadians prefer to fly from Ontario to Alberta, where the Rocky Mountain range breaks up the horizon with its high peaks. Tourists might want to avoid the long stretch of highway through Manitoba and Saskatchewan. Looking back, my portraits have become an endless landscape of similarity. At the moment, flowers and Canadian vignettes as I call them, are revitalizing me in ways that portraits were not doing any more. The scenery along the road has changed. 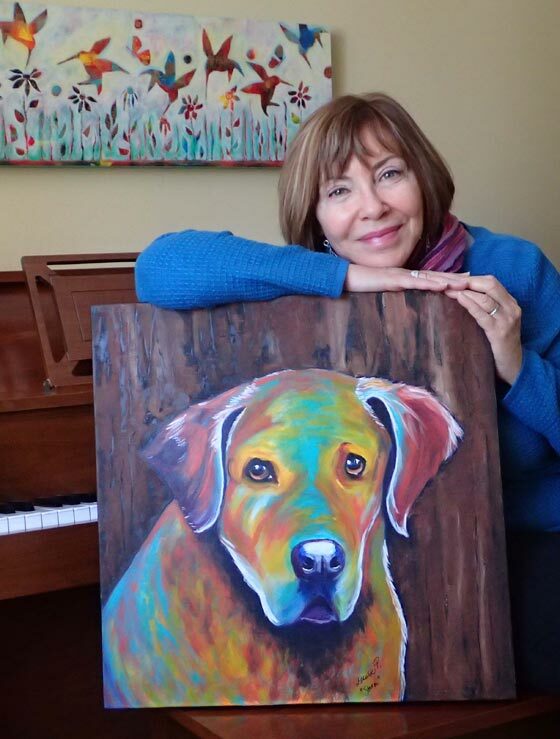 Painting pets is a joy for me so that will also be part of the artistic road ahead. But this creative detour I have chosen to follow will find me trying innovative techniques, and hopefully, present new challenges to overcome. So I am keeping the horizon in sight while awakening my senses on this different creative path. Have any of you, my readers and friends, taken a creative detour? If so, I would love to hear about it. What did you learn about yourself along the way? Was it a roadblock or a change of scenery that brought about the detour? (Photo in header taken by Louise Primeau along the Ottawa River bike path). Hi Louise, loved your comment about keeping the road ahead in sight and not shying away from detours. I think most of us get comfortable within our life and don’t feel secure in going in a different direction, but if one wants to really experience life it is totally necessary to break out of the mould and release some inhibitions. Fly free little bird …. well that’s what I keep telling myself. It seems as though I am always experimenting and finding something new (for me) to try. I love all the different mediums and techniques. I am never quite sure where I will end up or maybe this is just the way it will always be for me. Thanks Sally for the encouraging words.